best strategies for a successful business in BCCP’s CEO Series. 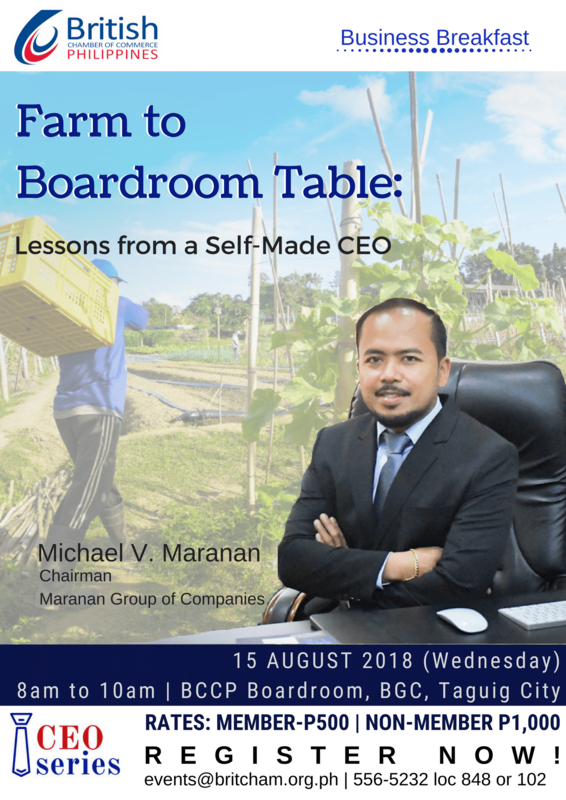 Join us on the 15th of August 2018 from 8am to 10am in this Farm to Boardroom Table, Lessons from a Self-Made CEO Business Breakfast with Mr. Michael Maranan, Chairman of the Maranan Group of Companies. Mike is one of the most inspiring business leaders and social entrepreneurs today. He will share with you his rags-to-riches story to help inspire you with your own businesses and share with you useful strategies for success. Mike has his humble beginnings in the farm at the young age of 8, and now owns several successful businesses in the country today. In recent years, Mike has provided mentorship, opportunity assessment and capital access strategies to entrepreneurs and SMEs. He is passionate about supporting the growth of entrepreneurs and SMEs through innovative technology development and commercialization. REGISTER NOW! LIMITED SLOTS AVAILABLE! Email us at events@britcham.org.ph or call 556 5232 loc 848 or 102. See you there!